I’M THE BIGGEST THING IN THE OCEAN and I’M THE BEST ARTIST IN THE OCEAN brought author-illustrator Kevin Sherry a tidal wave of well-deserved attention. As the days grow ever more Halloweenier, Kevin agreed to talk about his spooky new title, and some old favorites, too. 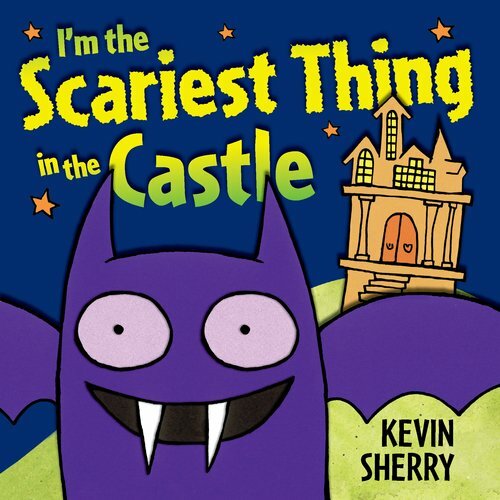 Was it hard to abandon the oh-so-sure-of-himself giant squid from I’M THE BIGGEST THING IN THE OCEAN and I’M THE BEST ARTIST IN THE OCEAN for a vampire bat in your new book, I’M THE SCARIEST THING IN THE CASTLE? Was it just time to get on land or did other issues factor into your decision? Well, I love my squid. We’ve been buddies for years and he’s given lots of kids (and their parents) lottsa joy and laughter. The Big Squid will always be a part of me. But I can draw lots of different animals, not just sea creatures. And when my publishers asked me to try a new title, “I’m the ______est __________ in the _________,” I thought it would be a fun way to incorporate the “scary” Halloween creatures that we’ve all grown up with. And I love rodents. Even ones that fly. When you think about the books you want to write, do you see them in some way before you know what the story will be, or are words and text entwined? I will start with the character, really. I’m constantly drawing and doodling in my sketchbook, because, who knows, one day one of my doodles could have their very own book! I’ll page through all my sketchbooks, and if I see a little (or big) creature who needs a little more attention, I’ll go ahead and figure out what kind of predicament he will get into. What were your favorite books as a child? Which characters did you wish could be your friend? All Shel Silverstien, especially THE GIVING TREE and THE MISSING PIECE. All Maurice Sendak, WHERE THE WILD THINGS ARE, THE JUNIPER TREE, IN THE NIGHT KITCHEN, KENNY’S WINDOW, HECTOR THE PROTECTOR, etc. Chris Van Allsburg’s POLAR EXPRESS and JUMANJI and BEN’S DREAM. But on the top, Roald Dahl. I’ve dived into every one of his stories. But what made me love Roald Dahl even more was his illustrator, Quentin Blake. I love Quentin’s fun, expressive scrappy drawings and watercolors. In third grade I wrote to Quentin and he actually wrote me back from his studio in London. Inamgine me, as a third-grader, receiving a letter from my hero. I was hooked on illustration from then forth. How do friends factor into your process? Do you share sketches/brainstorm ideas, or do you fly solo? I’m a little like the squid in the fact that I do indeed ride (swim) solo as far as my creative process goes. I would say I collaborate much more with the children’s section of the Enoch Pratt Public Library in Baltimore. Is there any book you wish you had the chance to illustrate? I’ve loved illustrating every book I’ve done, but I would have loved to come up with THE GIVING TREE. Almost a perfect book. How it didn’t win the Pulitzer Prize, I’ll never know. WHERE THE WILD THINGS ARE would have been nice, too, but I think Maurice Sendak blew that one out of the park. 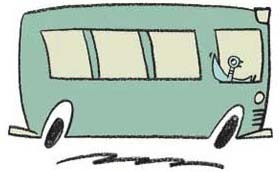 And Mo Willems’ books, DON’T LET THE PIGEON DRIVE THE BUS and KNUFFLE BUNNY are pretty, pretty brilliant. You can visit Kevin’s website to see more of his awesome artwork. This entry was posted in Uncategorized and tagged author/illustrator, Chris Van Allsburg, Halloween, I'm the Best Artist in the Ocean, I'm the Biggest Thing in the Ocean, I'm the Spookiest Thing at the Castle, Kevin Sherry, Maurice Sendak, Mo Willems, picture books, Quentin Blake, Roald Dahl, squid, The Big Squid, The Giving Tree. Bookmark the permalink. We love Kevin’s books at the bookstore where I work (in PA). And Audrey, I have to say: I love the word “Halloweenier.” Perfect word to describe October days. OMG, my little girls and I love the Biggest Thing in the Ocean. We are definitely going to have to get the Scariest Thing in the Castle–thanks for the heads-up! Awesome interview!